Cell Cycle Assay Kit (Fluorometric - Green) (ab112116) is designed to monitor cell cycle progression and proliferation by using our proprietary Nuclear Green CCS1 in live cells. 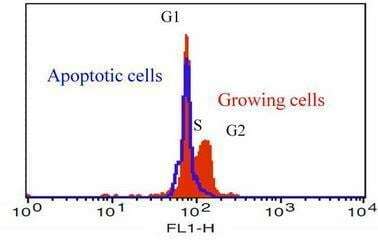 The percentage of cells in a given sample that are in G0/G1, S and G2/M phases, as well as the cells in the sub-G1 phase prior to apoptosis can be determined by flow cytometry. 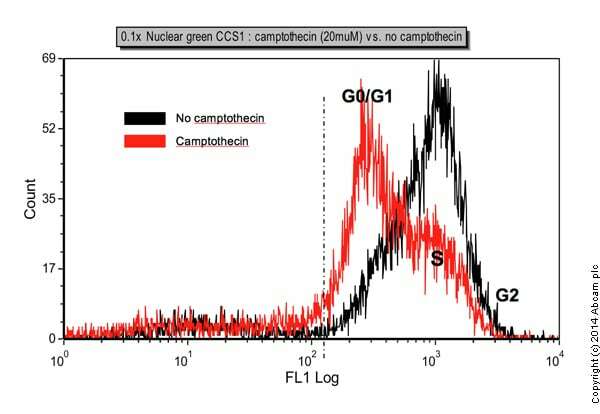 Cells stained with Nuclear Green CCS1 can be monitored with a flow cytometer at Ex/Em = 490 nm/520 nm (FL1 channel). DNA profile in growing and camptothecin treated Jurkat cells. Jurkat cells were treated without (red) or with 20 µM camptothecin (blue) in a 37°C, 5% CO2 incubator for ~8 hours, then dye loaded with 200X Green Fluorescence Probe for 60 minutes. The fluorescence intensity of 200X Green Fluorescence Probe was measured with a flow cytometer using the FL1 channel. I'm am just looking for some more details about the data analysis as there is very little information in the product protocol. It is quite hard to judge from the histogram given as to whether you are meant to see 3 distinct peaks i.e. G1, S and G2 as the normal plot or whether 2 distinct peaks is normal? I would also like to be given more of a guideline as to the segregation of populations for analysis and do you have a recommended protocol for this? Yes, you are right. The two distinct peaks are easy to see G1 and G2, the S phase is between G1 and G2 and it is not peak but more like a flat population, it is much easier to see it if you plot it as linear instead of log on X axis. See the following links and attached document for further details. Yes, these two kits are not species specific.